Photograph: Courtesy Cold Storage Cold Storage is a seafood restaurant within Swift & Sons. Restaurants within restaurants and bars within bars have been taking off lately—it helps owners maximize space and try out smaller concepts. Recently, Heavy Feather opened inside Slippery Slope and DAS Doner inside the Radler, and now Swift & Sons joins them with Cold Storage. 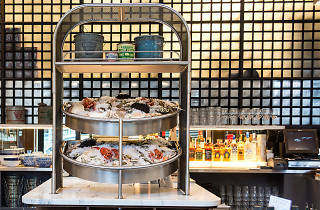 The oyster bar only takes up a fraction of Boka and B. Hospitality’s sprawling steakhouse, but it makes a big impact, with fresh and cooked seafood dishes. Start with oysters, which are available by the half or whole dozen or as part of a seafood tower. The perfectly shucked offerings change regularly, and on my visit included bivalves from Rhode Island and Massachusetts, teeming with liquor. Chilled crab legs aren’t on the menu, but ask nicely and you’ll receive fat chunks of crab to dip in horseradish-heavy cocktail sauce or creamy mustard. It’s hard to fill up on raw seafood, so order a refreshing Louie wedge salad with a generous amount of crab, or grilled octopus tentacles atop a bell pepper-nduja spread. The best, though, are the sardines, large, meaty fillets, accented with salsa verde. To eat: Spritz the fish with lemon, then place atop a saltine. End with a sundae or shake from Meg Galus, whose fresh mint ice cream is marvelous. Employees of the future West Loop Google office will be able to pop over to Cold Storage for lunch, and the menu includes sandwiches like shrimp banh mi. They’re extra lucky, because they can also head right next door to the steakhouse for dinner. Atmosphere: The space is small but energetic, with staff shucking oysters behind the bar and TVs showing the Bulls game. It’s a livelier, more relaxed counterpoint to Swift & Sons. What to eat: Oysters, sardines, wedge Louie. What to drink: I prefer beer with raw seafood, and the draft beers, including Moody Tongue Steeped Emperor's Lemon Saison and Buckle Down’s Painted Turtle, are $5. On the wine front, try a clean Chablis, or start with a cocktail, like the Chase Reefer, an icy mug of bourbon with ginger and pine liqueurs and a hint of lime. Where to sit: I always prefer to belly up at the oyster bar, but a handful of tables is also available. El stop: Pink, Green to Morgan-Lake. Bus: 8, 20. You can spend a good portion of your monthly rent on a steak at Swift & Sons, or you can sit down for a slightly more affordable seafood meal at the adjacent Cold Storage. 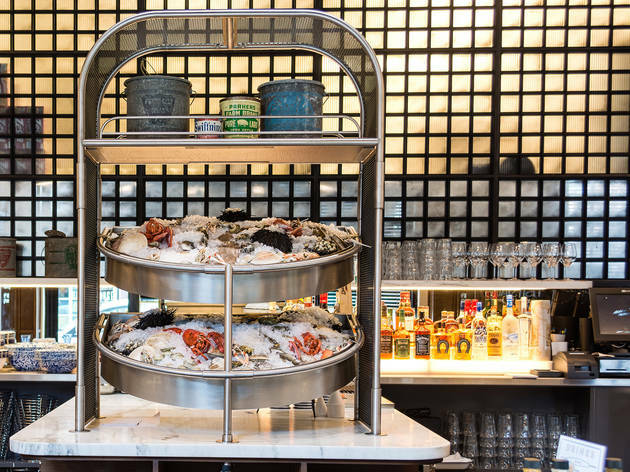 This classy oyster bar is always shucking something seasonal, and its $1 oyster happy hour is one of the better seafood deals in town (there's also a beer special). I went here yesterday for the $1 oysters from 3-6pm. The place was filled with much older men and women working in corporate America. We weren't expecting these people to be here since the Google office is in the same building. However, I love the atmosphere and vibe of the place. The oysters were delicious. The hot sauces here are unreal. We asked the waitress if we could buy them, and she said they are currently working on getting the paperwork done to sell them. So very soon you'll be able to get these hot sauces! The cocktail menu here isn't the greatest. I wouldn't say it's particularly worth getting a cocktail for me since I like to get craft cocktails rather than a "normal" cocktail such as a margarita. Finally, we decided we were still looking for something to snack on so we ordered the salmon gravlox. They were unreal. The beets they're served with really make them. We opted to eat them without the saltines since they take away from the flavor of the salmon. I don't often break my vegetarian diet, but when I do, I reach for the oysters, and Cold Storage is an absolute delight. A welcome addition to the already strong seafood menu at Swift & Sons.